Really for sale now. – Dirty wet dog , boats and sailing. My Devon Dayboat is now really up for sale with Apolloduck. This follows several months of faffing about trying to make decisions about what to do about my sailing this year. The situation has been clarified by my knee diagnosis so there isn’t really any excuse to not get the Dayboat on the market. 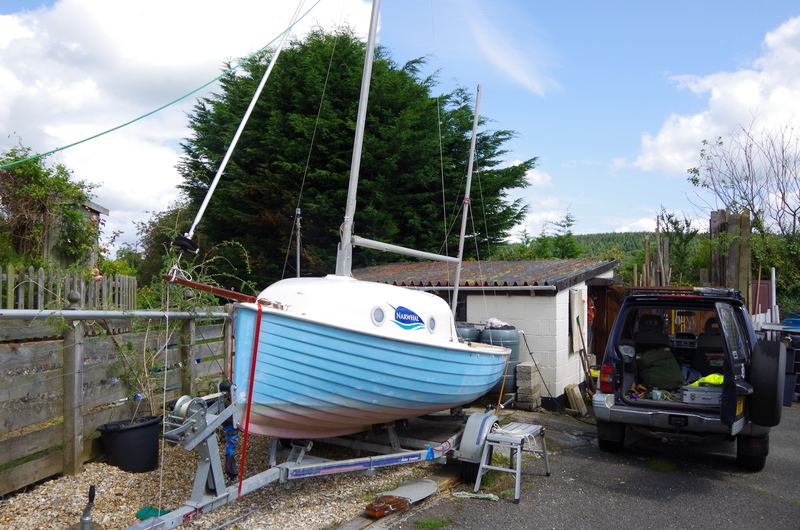 Whatever i get back from it can go on kit for the Liberty…really sensible would be a trailer as i could then just go and pick the boat up and bring it back rather than flailing around in southern ocean conditions in Lyme bay….equally it could pay for the new rig if i can track it down. I’m not going to add much detail here as i have posted all the information i have on the Apollo-duck website. The boat is pretty much as i bought it except for the jobs that i started : essentially that i have been building a new rudder which is mostly complete and sorting out a lighter rig. I have a lighter and longer mast from a slightly longer trapeze dinghy which looks to be a very similar section to the racing yawls…..hey maybe i should turn up at the nationals with a full trapeze and asymmetric kite…..only joking Ted ! The reality is that my ‘Raid’ style boat just isn’t going to work for the simple reason that kneeling is now out of the question…and i mainly have to kneel to work on it and i can assume that my scheduled knee replacement will preclude hanging out over the side on toe-straps. The boat still needs either re-commissioning or refitting. Really i think it needs a new rig and sails although the original rig would be ok for knocking around with. I think the new lighter rig would be much better for cruising.